With more than 8 years on our belt, we’ve evolved and changed so many ways as a company here at SaltyCustoms. However, one thing that has been consistent all these years have been the types of t-shirt printing we’ve had. We have added some new ones along the way but today, we are choosing to focus on the 3 main types of t-shirt printing that has stood the test of time! This is known to be one of the most famous and preferred t-shirt printing method. T-shirts that use silk screen printing usually stay vibrant and smooth for a long time. It handles color very well and is super durable when we’re talking about washing it and putting it in the dryer. Silk screen printing involves the creation of a stencil (or a template), which is then held in place by the screen. Nylon mesh is usually what is used to create the screen. Then, you pour some ink onto the screen and use a squeegee to press down on the template and this will then allow for the ink to be spread on the screen. Any excess ink will be wiped away and when the screen is taken off, we will have the design on the shirt! The pros of screen printing is that it is great for larger quantities as the screen can be used multiple times. It’s also provides a much faster way to create t-shirts. It allows for amazing quality and you are able to print multiple colors. The only downside to this is that if you are only printing a few pieces, then it will be expensive and not worth the money. Another print method that was made famous in the 90s is called the Direct to Garment method. 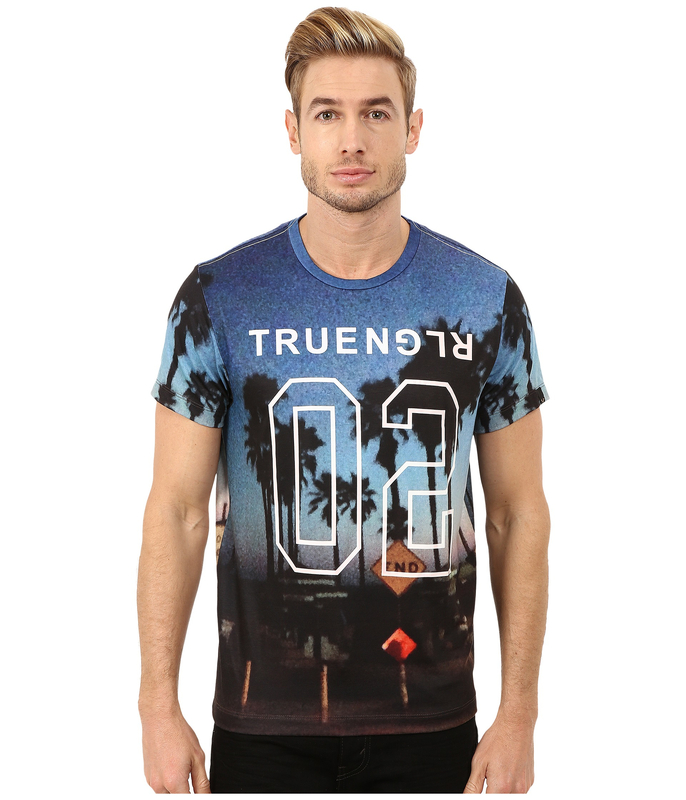 This involves printing your design onto your garment directly. The best way to imagine it is if you have all the shirts on a conveyer belt, and it goes through a printer and that is what DTG printing looks like. You would require a special DTG printer to get this print method to work and it is quite pricey and hard to source. The quality is also known to be great but not as great as silk screen printing but it can hold its own as well. It is also known that DTG works best on white garments and you will get a soft print with multiple colors. Printing on darker garments is not forbidden but it takes some time to perfect and it will be quite the challenge to get it done right. Some of the benefits of DTG printing allows for full-color printing and that it can support your one-off designs should you need one. In addition to that, it is a lot cheaper per item and you will still get that soft and professional finish on the garment. Dye sublimation printing is one that is a lot more fun and can become a very fun and creative project. It will definitely allow for your shirts to stand out from the rest. This is because dye-sub printing is basically a shirt that has all over print on it. With the dye-sub process you can take a print and print it multiple times repeatedly on the shirt. This works best for patterns like stars, galaxies and nature type print. Do note that for dye-sub printing to work, you would need special shirts that are made out of 100% polyester. The pros of this process allows for highly unique designs that covers the whole t-shirt. You have unlimited use of designs and styles at your fingertips to play with. The bad side is that the shirts have to be made of 100% polyester which might not be everyone’s favorite. In addition to that, to allow it to be cheap enough to print, you would need a minimum quantity order of 50 pieces. 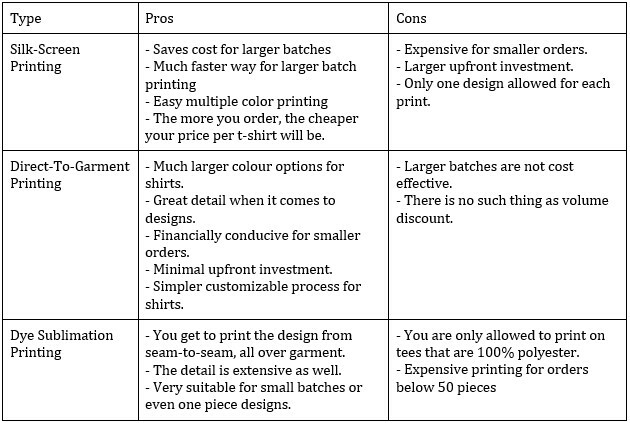 We have added a table for easier understanding of the pros and cons of these 3 different types of print.